Nicolas Cage and John Cusack released "Frozen Ground," a feature film based on Robert Hansen, the serial killer known as "Butcher, Baker." IMDb now has stills from "The Frozen Ground," the film inspired by Butcher, Baker." 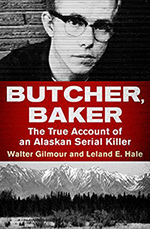 The biggest news on this front came in July, 2011, when Producer Randall Emmett (Wonderland, Amityville Horror) announced plans to shoot a film about Robert Hansen, the subject of the true-crime work Butcher, Baker. The film based on Hansen's crimes, "Frozen Ground," stars Nicolas Cage and John Cusack. Filming started October 17, 2011. Alaska filming ended on November 26, 2011. The film is currently available for rental on Netflix, Amazon and iTunes. Cast against type, Cage plays the sensitive cop featured in "Butcher, Baker" -- based on Alaska State Trooper Sgt. Glenn Flothe. Cusack plays the role of the killer, Robert Hansen -- again, against type. As you can imagine, this has spurred considerable interest in "Butcher, Baker." Vanessa Hudgens to star as teenage prostitute who escaped from Hansen and helped bring him to justice.